This post is going to be a bit different than my usual fare, which often focuses on the more technical aspects of going paperless. I’ve been writing DocumentSnap since the summer of 2008, and have had the opportunity to communicate with a large and fantastic group of readers. Many have gone paperless and want to optimize their workflow, but many have been struggling to get started. They know (sort of) what they want to do, but find the whole thing too overwhelming. This has been bothering me for quite some time, but I couldn’t put my finger on why or what to do about it. At Leo Babauta’s Zen Habits meetup and at Pam Slim’s content map session, I realized that I needed to outline my thoughts in a post and figure out what it is that is holding people back. In this post I aim to tackle both subjects and to convince you that at the end of the day, the only thing that matters is to start. One of the great things about the Internet (and, more specifically sites like DocumentSnap) is that there is so much information out there. On almost any topic, you can find a metric ton of articles telling you how to do exactly what it is that you want to do. On the surface this sounds great: the more information the better right? It would be fantastic, if it were not for the type of issue that we are trying to solve by going paperless. More often than not, we are starting down this path because we already have a problem: our workspace is a disaster and we can’t find anything, we have 300 boxes of paper in our way, we need to downsize, the list goes on. If we are already overwhelmed by the problem we are trying to solve, layering onto that an overwhelming number of solutions leads to shutting down. Instead of looking at the big picture, we start to focus on the details. What should our folders be called? What is the perfect folder structure? Which is better, this software or that software? What on earth are tags? Ahhhh! I am sure you can guess what comes next. By going crazy focusing on the details of our problem, we don’t actually do anything. The number one area that this paralysis occurs is around folder structure. Before I continue, I want to stress that I am not at all against having a defined folder structure. Having a folder structure that means something to you can be very helpful. I have received many emails that start with “I know I shouldn’t use folders but it is just the way my mind works…”. I couldn’t figure out where I picked up this reputation for being anti-folders, until I realized that a section title in my 4 Ways To Tame Your Documents ebook was “Forget Folders”. Oops. The point I was trying to make in that section, bad title aside, is that with modern software we don’t need to go nuts creating a huge folder structure. This causes two problems: 1) It causes us to spend more time figuring out where to file a document, and 2) It causes the sort of detail-paralysis I referred to above. We spend so much time trying to come up with the perfect folder structure, we never actually start scanning. Having said all that, if you like your folders, no need to apologize. Use whatever works for you. Based on the emails that I receive, fear is a big issue with DocumentSnap readers. If you are reading this and you can relate to a fear of getting started going paperless, I will first tell you that you are not alone. Part of the reason that I started the Paperless Reader Stories feature is to share some of your fellow readers’ stories. They have overcome their fears and obstacles (or are in the process of doing so). 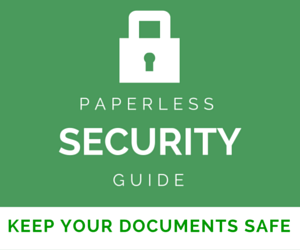 While everyone’s situation is different, there are two basic fears that people have when going paperless. The first fear that people have is that once they scan something, they won’t be able to find it again. If you’ve ever tried to hunt through your computer for a file that you know you saved, you’ll understand this fear. Keep your document archive separate from the rest of your files. If you save it in Documents on the Mac or My Documents on Windows, create a folder underneath called ARCHIVE or File Cabinet or something and put your scanned documents in there. Make sure that your PDFs are searchable by turning on the OCR settings in your scanners’ software, or using a software package with OCR capabilities. Use a consistent naming convention for your files and stick to it. Use a folder structure that makes sense to you. This one is a biggie. It takes a lot of confidence to shred a document that until now you have religiously kept in your bulging file cabinet. The simple solution to this fear is to trust your system, whatever it happens to be. As long as your documents are backed up in multiple locations and you have the ability to find them again, you should be good. However, even that might not be enough for you. I especially see this with married couples where one spouse wants to go paperless and the other is afraid. Sometimes no matter how bulletproof the system is, the fear of shredding documents is just too great. If that sounds like you, what I recommend is that you still go through the scanning and indexing process as if you were going paperless, but then instead of shredding the paper, throw it in a box out of the way somewhere. This is where Eddie’s system might come in very handy. This way, you have the benefits of a paperless workflow like searchability, backup, and lack of clutter, but you have the peace of mind of having the physical paper somewhere. You’ve seen that focusing on the details and succumbing to our fears causes paralysis. This is not in any way unique to going paperless. Does this sound familiar? (I’m talking about going paperless now, not dieting!). If it does, not to worry. There are some things you can do to just get started. A lot of information that you read online is complex. I am more guilty than anyone on this point. I would post crazy Applescripts and Hazel workflows all day long if I could, because I am a geek and sadly, that is the sort of thing that I find fun. I also have a great group of enablers such as Michelle and Alex that read the site, so it just encourages me. Of course, normal non-geeks read this stuff and become overwhelmed. All they want to do is make their life easier, and this crazy Canadian is talking about Source URLs and text expansion? All of this is so confusing to me. I have been ready, willing and able to go paperless, but like bungee jumping for the first time, I can’t bring myself to do it out of fear. I read the 7 lessons, but there is so much talk of other apps: Hazel, Evernote, Snippet and others I can’t even remember. Where do I start and how do I learn to be at the level of all the users here? The solution to this is to just ignore the complex stuff. That’s right, just ignore it. None of it is required to successfully go paperless. You can come back to it if you ever need it, but for now, just ignore it. Get a decent scanner. 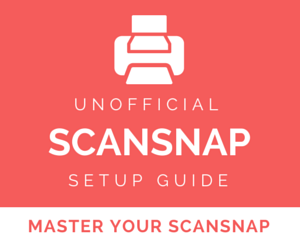 I like the ScanSnap, but it is certainly not the only one on the market. Create a very basic, very high level folder structure. When you find that it makes sense to you, create subfolders on an as-needed basis. Set up your scanner to scan to an inbox folder. In the scanner settings, make sure that it is set to create a searchable PDF. Once you scan, name the files appropriately and move them to the appropriate folders. That’s it. Start with this for a week or two. Once you have been doing the basic scanning workflow for a while, if you find that there are things that you wish were a bit easier start writing them down. Do you wish there were ways to make renaming files faster? Do you see points that you wish you could automate? Do you think it’d be easier to just have everything in one software package vs. your native folders? Would you like to have access to your documents on the go? Could you make things faster to find? 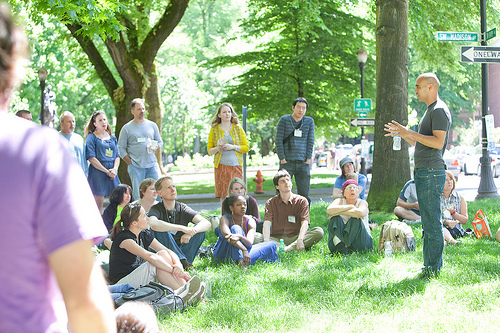 On an as-needed basis, start looking into solutions to the points of improvement that you come up with. 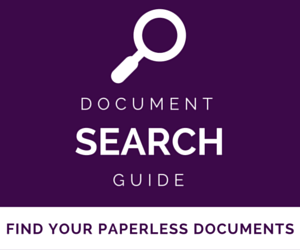 (Quick plug: the Paperless Document Organization Guide may help with this). The point is to make the changes that you want to make when you want to make them, bit by bit. Maybe you’re happy with how things are now after your test, and that is awesome. Keep doing what you are doing. Does this resonate with you? What barriers do you have, or have you overcome? I’d love to hear your thoughts either in the comments or the forum. I have been going paperless for years now. I have noticed that over the years I have scan like crazy at the beginning but not so much anymore now. Today I am more selective on what stuffs to digitize as I find it time consuming. Stuffs that’s not important, ignore it and be ready to ditch these. Stuffs that are important, try to scan it asap and add a small tickmark at corner or back to identify that the document was scanned. I find that the OCR wasn’t too reliable years ago so I have been doing without this feature. Today’s OCR seems to work better so might be worth a try again. Instead I use native folders with files instead of using a software solution to house the entire data (i.e. EverNote). Native folders coupled with Windows file indexing software called “Everything Search” and I can quickly find anything as long the filename and/or folder sufficient detail. The whole idea is to use folder and file name as “metadata” without the searchability of each file’s content. I’ve been using this approach for years and still am happy with it today. Nice Devin, thanks for sharing. You're right that there is no point in digitizing something that you don't even need.OCR is much better now so it is worth looking into, and your filing/search strategy is very similar to mine. 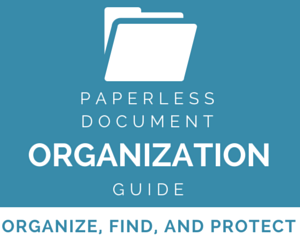 Organizing is very important when you think of going paperless. Just like you wrote knowing the right folder to find the right information quickly and easily is a must.. I learn that from my old computer files. Too much information store in download folder is not going to do you too much good. They need to be moved and organize, that you find it right away. Exactly what happens with me…stuck with details, what & how to organize folders, fear of throwing papers! Brooks you da man! I have been doing fairly well with my ScanSnap S1500 scanner for a while and have a pretty good folder system but still huge issue with papers…mostly, it is time issue with me..terribly busy to not even have time to scan fast enough with the influx of all the papers, kids school and sports photos, you name it…that's what makes me overwhelmed.. Thanks for the great article..Honestly, $47 for your guide is not a big deal but, don't know if I will find it valuable enough..not to mean it is not valuable but how much for me. Totally understand and no worries at all. :)Thanks for the kind words! what is an index anyway? is it something i download to help me stay more organized? No sorry, an index is something that your operating system takes care of for you. Basically, Windows 7 will keep a list of all the files on your computer and all the text in those files that it can read, to make it faster to find these things. What do u mean exactly when you say that you use an indexing system along with the searchable PDF function? searchable ….do u mean I can use the windows search/find function ? Exactly. Make your PDFs searchable, and then in Windows use Windows Search which will search both the name and the contents of your PDFs. just to clarify further if for example i bought a 60" tv from best buy and i scanned the receipt 8 months ago and the naming scheme was weird like …"electronics store on robson.pdf" but i made it a searchable pdf file. you are saying that i could type into the windows search box for "best buy samsung 60" inch" and it would find the scanned pdf for me? Right so IF your receipt had the text "Best Buy" and if it was in a readable form that OCR software could recognize, it should be found in a search for "Best Buy" even if you don't have those words in the name of the file. I've studied the User Manual and Help Files to no avail. I can think in terms of a spreadsheet but I can't fathom a database. I know I should have finished the Paradox course I was enrolled in 20 years ago! I think the problem for me is integrating the analog file structure I've used for years with an understand of a database manager program. I'm lost on the hierarchy. What was once a simple iteration of the alphabet is lost now on how to set up the database. I guess? Hi Brooks, Sorry it's taken so long to respond to your article. It resonates so well, I thought you had interviewed me before you wrote it. The parallels are uncanny. Thanks for your appreciation of the struggle. Today, I'm still up against a wall regarding structure. Maybe I'm using the wrong tools. I didn't buy a Fujitsu. 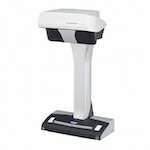 I had already purchased a NeatWorks ADF desktop scanner. I'm struggling with their file structure framework. The software is programmed with predefined Inbox with three 'trays.' Receipts, Business Cards and Documents. The first two are easy and no problem so far. The third, 'Documents' is where I'm having a real problem in creating the structure. Folder Name; Folder Type and Folder Label are throwing me for a complete loop. With regards "Fear of Throwing Paper Away". As a bookkeeper, I implore people NOT to toss their original source documents pertaining to their business … things like receipts, loans or financial contracts, insurance documentation, purchases of capital assets … you get the idea. The reason is, in Canada anyway, that scanning does not meet imaging standards as documents can be altered … making them inadmissable in court … which is important to a tax auditor. I'm fairly certain there would be similar rulings in the U.S. Okay that is my two cents …. everything not financial related … go for it and toss … feel the satisfaction that comes from getting rid of all that paper! * user evernote but it turns out they dont always OCR PDFs especially those that are written by hand. * manual OCR means running an app on your PC that will take time and slow your machine down. this is a bottleneck when you are doing more than one thing at once. * why isn't there a tool that scours your folders/hard drive for potential text documents that have not been OCR'd and just does it for you especially in your computers downtime when you are not using it and without having to be managed by the user. now i know that tools like scansnap and others are getting better at this with packaged OCR, etc but i dont think good enough. i've also explored the web-based options and would like to find a tool that integrates with dropbox that can work in the cloud to OCR documents that you put in a specific dropbox folder. this way its not tied to a single machine and makes using my mobile devices for scanning a more versatile option as well. Good points about OCR. That's a great idea about having some tool that will server-based OCR files that you pit in a certain folder. Sort of a set it and forget it deal. Interesting! Fear – it is the elephant in the room. I find that I am indeed ready to go paperless. For me, going paperless is the perfect way to fit all of my documents, pictures, and books into my much smaller home (we recently downsized). I am dealing with my husband who not only doesn't want to scan documents, he even wants paper bills now (I think this attitude is just a comfort issue, like wanting your huggie-blanket.) We have been through some wrenching changes this year, and I understand his need, but I also need to have fewer things – we just have too much to store. So, while I am scanning my own things, I'll be showing how liberating going paperless can be. Good luck to all who are trying to convince their significant other about this process. Thanks Julie, that is a great point about fear of not having the paper in the first place. I should have mentioned that. Good luck, it is definitely hard when there is someone else in the equation! Love the post – the simpler things are, the more likely they are to get done. Loving the paperless life – needed to find something I had scanned a few months ago this morning. So nice to be able to find it within seconds! I never would have been able to find it at all in the old paper-only system. Thanks for the link to Eddie's system – just dumping the paper versions into a bin labeled by year. That would be awesome, given that some of my family members get stressed when they see me shredding. That way I would have the scanned version, and they wouldn't feel like I'm vaporizing important documents. Thanks Meg. That's cool about being able to find that document in seconds, one of the reasons I am so pro-scanning and indexing is that sometimes you don't know that you are going to need something until you actually need it. A yearly bin is also my solution for the legal requirement of keeping some papers for ten years. Instead of thinking about it I scan everything and put it in the last of ten bins. At the end of a year I can trash the oldest bin and recycle it for the new year. Exactly what I needed. Last night I was on amazon.com trying to decide whether to buy the ScanSnap or not. Printed out (oops!) the reviews and comments to read in bed, so close to starting yet didn't get up to push the button to buy. Well, after today's post, I went back online and bought the darn thing, ready or not. Once it arrives, I will just START. I had been worrying about folders, Evernote or Devonthink or whatever else, but I'm just going to jump in with one folder called PDF Cabinet and scan away. Sort later. Thank you for the kickstart. Thanks so much MH, your comment made my day! This. The whole post. Excellent. Get the Scansnap. Start with something small – a folder from your filing cabinet. The least important maybe. Scan it. Live with it for a few days or a week. Don't throw the original out. (just put a special pencil tick mark on the item so you'll know it's been scanned. Pretty soon, you'll be scanning right and left. Worry about keeping/shredding later when you're truly comfortable. My biggest fear starting was thinking about that big pile and the file cabinet that all needed to be scanned. Once you start it is easy though. I would sort and prep documents while watching TV and then could scan whenever I was around the house. Grab the next doc and put it in the scanner, press the button. The pile gets smaller and eventually goes away. Awesome, that's the perfect approach Tom – start bit by bit and combine with other activities. Thanks for sharing.